Our service includes repairs of building and recycling equipment; starting from repairs of mechanical parts to the overhauls of hydraulic and electric systems. 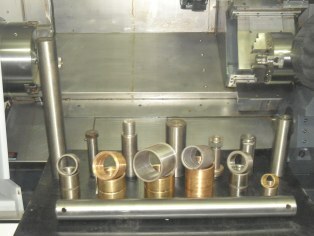 We offer regeneration of hydraulic cylinders, slewing rings and pin joint mountings, shafts and bushings. Included in our services is replacement of a geared bearing of any excavator machine. We guarantee our service with the use of genuine parts, or substitute - new and used, as per the customer's request. For removal of clearance at excavator booms, pin joint mountings we use a special machine: mobile, electronically controlled welding and in-line boring. It allows restoring initial dimension even in case of highly oval irregular holes without necessity of transporting machines to the special workshop able to machine large-size elements. We regenerate holes from 50 to 300 [mm] and length of sleeve up to 250 mm. Our company offers very sophisticated repair services, upgrades and inspections of existing electrical for industrial machinery, mainly for reloading and recycling of metals. We build complete electronic, pneumatic and hydraulic control panels including control of material handling electromagnets on the loading machies. We utilize our experience for repairs and modernization of various machines for construction machinery. We offer technical help and spare parts for control systems components. We design and build control panels for machinery. Our company installs transformers and contactors for electromagnets along with control panels. We also provide programming services for dammaged hydraulic systems and we program various new machinery. We equip machines with heating, cooling and temperature control systems for hydraulic oil. The control panel in the operator cabin allows control and monitoring the function of press-scissors, packing machines and presses for scrap metals.